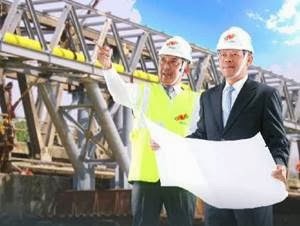 PT Nindya Karya (Persero) - Nindya Karya is a rapidly expanding state-owned company in Indonesia, running business in general construction industry. Nindya Karya was formed in 1961 as a nationalization result of Dutch company named NV Nederlands Aanemings Maatschappy (NEDAM) Vorheen Firma H.F.Boersma. Nindya Karya is a non listed state-owned company and is 100% owned by the government of Indonesia. Nindya Karya is domiciled in Jakarta and now supported by a total of more than 658 employees (273 permanent employees and 385 non permanent employees) spread in 21 branches spread in 6 divisions throughout Indonesia Indonesia. The Company's head office is registered at Jl Letjend MT Haryono Kav 22 Jakarta 13630. Nindya Karya also supported by 2 directly-owned subsidiary companies, namely PT Nindya Beton and PT Marga Kunciran Cengkareng. In 2014, Nindya Karya booked an increase in its operational performance. Nindya Karya reported total assets of Rp 2,506.19 billion in 2014. This total assets figures reflected an 18.69% increase from Rp 2,111.42 billion in 2013. Nindya Karyas net income experienced growth of 2.18% to Rp42.58 billion in 2014 from Rp 41.67 billion in previous year, according to PT Nindya Karya (Persero) Annual Report 2014 as cited by JobsCDC.com. SMK/D3/S1 in Informatics Management, Informatics Engineering, Information System. Expertise with MySQL and PostgreSQL database. Expertise with OOP and MVC programming is preferred. Good understanding of jQuery, Ajax, json, extJs is preferred. Expertise with Codeigniter Framework is preferred. Expertise with CSS Framework (Bootstrap/Foundation/Materialize) is preferred. Expertise with Adobe Photoshop will be an extra advantage. JobsCDC.com now available on android device. Download now on Google Play here. Please be aware of recruitment fraud. The entire stage of this selection process is free of charge. PT Nindya Karya (Persero) - SMK, D3, S1 Professional IT Staff Nindya Karya June 2016 will never ask for fees or upfront payments for any purposes during the recruitment process such as transportation and accommodation.